Lauren Bates is an associate at Pettit Kohn Ingrassia & Lutz PC. Bates primarily represents businesses in employment litigation matters, including the defense of discrimination, retaliation, harassment, wrongful termination, and wage and hour claims. In addition, Bates represents companies and individuals relating to business litigation, personal injury and product liability matters. Recently, Bates co-chaired a jury trial on a large-exposure product liability case that resulted in a defense verdict on behalf of her client. She also obtained summary judgment for a client in an employment case involving allegations of wrongful termination and discrimination. Bates earned her J.D. at the University of San Diego School of Law in 2011. While attending law school, Bates was a law clerk for the United States Attorney’s Office and served as an extern for the Hon. Marilyn L. Huff, U.S. District Court, Southern District of California. Additionally, Bates was a board member and lead articles editor for the San Diego Law Review. Prior to law school, Bates earned her bachelor’s degree in international studies with an emphasis in political science from the University of California, San Diego. Bates is a member of Lawyers Club of San Diego and the San Diego County Bar Association. In her spare time, she volunteers with Voices for Children as a Court Appointed Special Advocate for foster youths in San Diego. Bates lives in Encinitas with her husband, Ryan, and their two golden retrievers, Norman and Daisy. This is the culmination of a peer nominating process that asked San Diego County lawyers to name the best young attorneys in San Diego County who are: Hard-Working & Detail-Oriented, Knowledgeable & Enthusiastic, Ethical & Professional, and Committed to Furthering the Interests of Justice in Society. Harris Personal Injury Lawyers Inc.
Don't miss this opportunity to recognize your peers or congratulate the San Diego Young Attorneys. 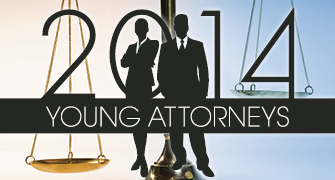 Highlight your company's expertise by advertising or sponsoring Young Attorneys 2014. Contact us at 619.232.4381 or contact@sddt.com to receive additional information today! Associate at Allen Matkins San Diego, Timothy Hutter's drive and passion for law have earned him recognition as a top Young Attorney for 2012 by The Daily Transcript. Transcript reporter Doug Sherwin talks to Nadia P. Bermudez of the Brown Law Group LLP at the 2007 Young Attorneys reception. Transcript reporter Doug Sherwin talks to attorney Leslie B. Overman of Heller Ehrman LLP at the 2007 Young Attorneys reception.